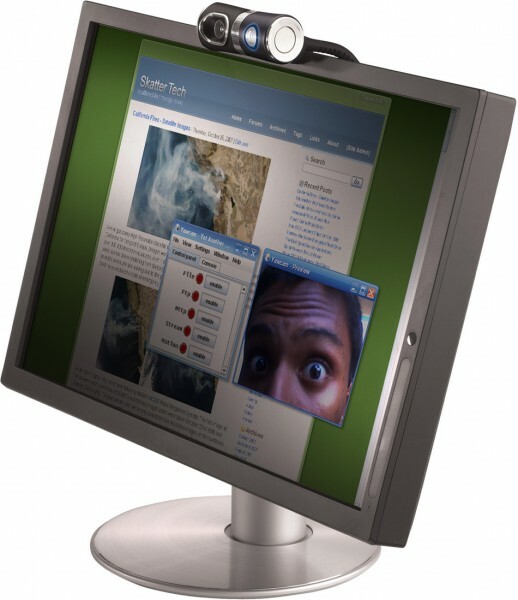 Just about every new laptop purchased today is bundled with a built-in web cam. It’s a great accessory for video conferencing, but there are also plenty of other useful things to do with them. This tutorial will demonstrate how to turn just about any web camera into a security camera which will capture any movement it sees using motion technology. No extra components or tools required! Note: If you have a USB camera, plug it in before starting up yawcam. If yawcam says “No Device Selected”, go to Settings -> Device -> Change to -> [select your camera]. If you are able to view your camera in the Yawcam Preview window, proceed to the next step. 2) Blue lines should appear when you move your hand past the camera. 3) Click on the Actions tab and un-check Play Sound. 4) Select Settings… for Save file and Activate Image array. 5) Finally hit the enable button to begin monitoring! Note: If you see a lot of static or in the motion detection window, go to the Motion Detection window -> Settings Tab -> Detection Level -> Select Auto detect. Step away from the camera and make sure nothing in it’s line of view is moving while it is adjusting. At this point any movement past the camera should be captured and will be displayed under the Motion Events list. 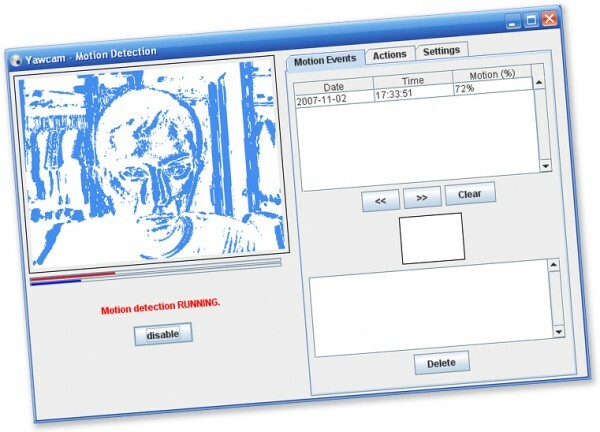 A date & time stamp along with the percentage of movement detected will be provided with each captured frame. If you would like to save higher quality images into a folder, enable the Save file option found under the Action tab in the Motion Detection window. Optionally, you can ask Yawcam to automatically upload each captured image to an FTP server or email it to yourself. Yawcam unfortunately can not capture video clips at this time. There are however some paid applications which support that feature. This isn’t exactly the BEST security camera technology, but it is definitely a good start. It is also neat to actually make use of your web cam if your laptop has one built in. The best part of all of this may just the fact that Yawcam is completely free and that it only takes a few minutes to setup. Yawcam does support plenty of advance features, however we will not go through setting those up. Just for example, you can quite easily broadcast and stream your camera to any computer with an internet connection or even play scary sounds when your machine detects motion. Anyways if you know of any better apps or have questions, please reply in the comments or visit our forums. dang i just got it running on my laptop and its niiice! i left it facing out my window towards my front door. i was able to see when the mail man comes to drop off the mail and stuff! Wow – that’s a really cool idea. Webcams really are THE tool these days. I love the idea of playing spooky sounds when the machine detects motion. Imagine a would-be thief running with fright, as your computer lets off ‘fearsome_yell.wav’ or something similar. Also, don’t know if you guys have seen it, but I work for Oovoo which is a super, and completely free, way to web-conference with upto 6 chums at once. Perhaps you could show a load of people how to make security cams. glad you liked the security camera tool. I just took a look at Oovoo and it looks quite promising. I had never heard of it before. I assumed it would be a Skype-like app at first, but it seems impressive since it can do a video confrence with up to six persons. (Skype is still limited to one-on-one for video chatting.) I’ll take a further look into this soon! Thanks for the tip. opensource, ability to capture video and motion detection. Thanks for the suggestion, I will take a look into Dorgem soon. If it’s video support works, it might have already beat what Yawcam offers. Yawcam is good, but there are things that could be better. P.S. Does anyone know of any applications such as this for Mac OS X? These are some great tips thanks! I’ve been using ooVoo (www.oovoo.com) for my video conferencing needs the past couple months and have found the service to be great. Some of these tricks should make the experience ever better, thanks! can i do more than 6 people ? Well, the control panel and everything looks useful and great. It’s just that little small error… When starting (or trying to) or trying to detect my webcam the dataexecuteprotector built in in vista shuts down java. I tried excluding ALL java related programs from it, but somehow it still crashes java and thereby chrashing yawcam. Any suggestions? This comment is fake, watch out. Or try out http://watchinator.com without installing anything. Love this, pretty sure my 18 year-old step-brother is using my computer and snooping through my room when I’m at school and if I find out he is…ooh it’s gonna go down.